Things have been pretty hectic these past few weeks. A combination of chasing deadlines, travelling and getting a nasty bout of flu for a week or so (fortunately not while I was travelling) has left me exhausted. The travelling was fun though! First of all, I went to Edinburgh a few weeks ago. Soundwise, I don’t have a great deal to report about the trip, except that I wish I’d had one of my portable recorders handy during an impromptu visit to the Scottish Parliament building one afternoon. 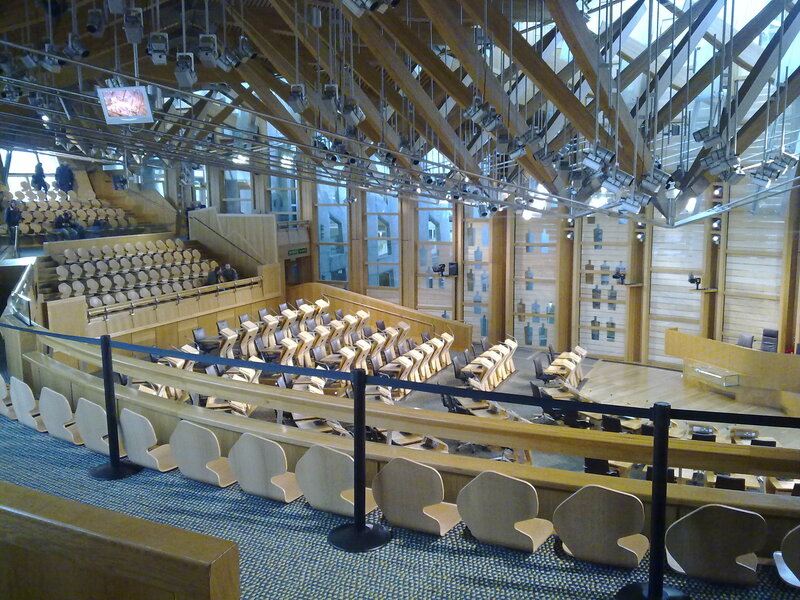 It’s a stunning piece of architecture (although apparently it suffers from numerous design flaws) but the feature that most struck me was the acoustics (surprise, surprise) in the debating chamber (pictured above). It wasn’t that busy when I was there but the few people who were present were having quiet conversations amongst themselves which created a really interesting, intricate chat ambiance. Obviously the acoustics of the chamber are designed to dampen reverberation in order to enhance intelligiblilty amongst speakers seated in a variety of positions within a large space. Consequently, even these quiet conversations people were having over on the other side of the chamber seemed to carry across the room, but in a surprisingly dry rather than reverberant way. The building apparently has it’s critics but to me it seems, aesthetically and acoustically at least, to be a really innovative design. If anyone out there has been more ever-ready than me and captured a recording of voices in the chamber, I’d love to do a swap if you’re interested…. Anyway, shortly after I returned home I got really ill with what might have been swine flu but, then again, could just be your standard, run of the mill flu – who knows? In any case, I felt terrible for a week while still having to attend ADR sessions in London for a film that I’m involved in at the moment. Fortunately, I was pretty much back to normal just before I needed to fly to LA for the best part of four days for another ADR session which was split over two mornings so that we could link up with London via ISDN. The two sessions at Todd-AO West both went well and, as always, it was interesting chatting with professionals from other shores about their craft, as well as learning a bit about sound post facilities in the U.S. The sessions finished by about 2pm so I had a few hours each afternoon to entertain myself. Unlike in Edinburgh, I remembered to pack a recorder this time (only the Zoom H4 but, hey, better than nothing) so as soon as I got back to the hotel I grabbed it and set off exploring; firstly, for somewhere to have lunch and then I was off in search of some interesting things to record. 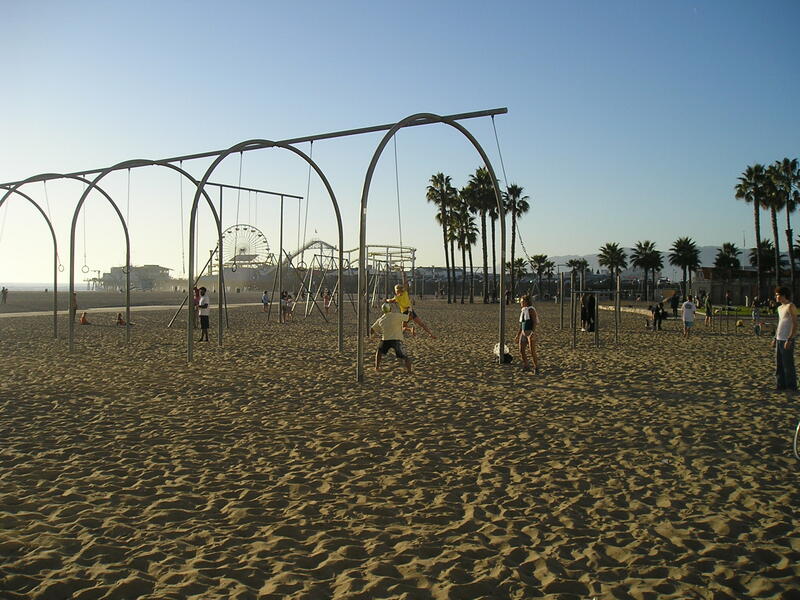 My hotel was a block away from Santa Monica beach, and some of the guys who I’d been working with had been telling me about what a freak show it can be down there around Muscle Beach, so I headed seawards in the hope of capturing an unusual chat track. However, as you can see in the picture, it wasn’t very busy and not very freakish, so I soon moved on. A bit later on though, while I was diving into the deep end of American fast food with a chilli cheese dog at one of the Beach Cafes scattered along the promenade, a bunch of teenagers started up a game of beach volleyball near where I was sitting, so the Zoom did get put to some use after all. I recorded a few other things as well; traffic, the Pacific Ocean (which sounded like a white noise track through the Zoom so I doubt that it will make it’s way into my library) and the electronic locking device on the safe in my hotel room! I don’t suppose ‘recording sound FX’ would come up as a very high answer on the quiz show ‘Family Fortunes’ if a contestant was asked to name something travelling businessmen get up to in their hotel rooms at night! Oh well, keeps me out of trouble I guess……. I’ve just realised, having looked on Wikipedia, that the reason Muscle Beach was so quiet was that where I was isn’t Muscle Beach anymore! It is where it was originally located but it shifted further down the coast to Venice in the 1950s. Unfortunately, I didn’t get that far down the beach on my couple of walks. Next time, I’m hiring a Segway like everyone else!